Unpruned prunus. The banging of doors, his. Let’s not have too many of these frills. Soon I will fold up my mother’s clothes and take them to the Red Cross shop, where, in February, she sent me with clothes that were not good enough for the bring and buy. More than nine inches of rain fell during the 24 hours following the evening of 15 August 1952, one of the heaviest rainfalls ever recorded in the British Isles. Mrs Ellen Jenkins grasped Dilys’ hand and nightdress so hard in order to retain her hold on her daughter that her hand remained clenched for three days afterwards: Harriet Bridle. That series of abstract paintings is just exactly the clouds above the estuary until a seagull gets in the way on the sea wall, which must be a relief for the readers, as they have got it entirely. Someone asks which are the clouds and which is the sea, and obviously the sea is up there and the clouds are down there. They are so neatly folded that there is nothing to fold up, nothing at all, only things to take out of her handbags. She kept everything. Holland after the war. All the old pens. I am not really moving these objects around like a chess game, because then I would know their identities. They have increased the land drainage level to allow for the flooding, and the Sedgemoor beef farmer lost 40 acres in the summer. He thinks that without hunting we lose touch with ourselves, with nature, and our place in the food chain. The new type of jig saw puzzle is a three dimensional mansion. He’s been up there all day in his room with it and he’s got as far as the first floor. The speed of discussion on the net is always a problem, but more than that is the anxiety that not enough has been said. Perhaps it is better to go away and think about it, and remember this crossroads and a place to pick whortleberries. A gorse bush had fallen across the narrow cliff path, and it was difficult to climb round it. On the second day it was still there and I pushed hard on its prickly thick stem until the root shifted in the soft wet earth, and it stayed against the bank and did not whip back. There was a pervading smell of earth and the lightning revealed 40 foot walls of silt. My father wants me to write in the memorial book and I resist and think only of clichés, who loved these woods. But I imagined my mother seeing these oaks, and say that I will write something 'poetic and original' and he is glad that someone will. He praises her calligraphy and she says that the entry can be as long as we like. Those are the scars that were her eyes, on the tall slim trunks of the silver birches, up into a blue sky. Always prune the rose bush so that the eyes are facing outwards. The paintings are called 'Broken horizons: shattered dreams', but I think that she liked the yellow in it. 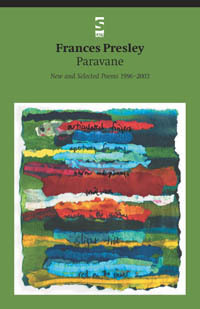 Somerset Letters was originally published as a book by Oasis Books in 2002, with selections, including this one, later included in Paravane: New and Selected Poems 1996-2003 (Salt, 2004). Presley's last two books were published by Shearsman; to learn more about her and her work and read selections, please see her Shearsman author page here. This prose poem is successful as its imagery implies a person going through their late mother’s belongings – folding her clothes, emptying her handbags etc, but the poet never states this outright. The conversational tone, and the way the quasi-narrative jumps between this and unconnected subjects such as recorded rainfall and drainage methods, suggest a stream of consciousness in a distracted mind - one that is perhaps trying to avoid fully acknowledging the loss by concentrating on other, trivial detail. Nevertheless, the end of the piece infers that their mother’s memory permeates everything, even the rosebushes in her garden – which brings us back to the beginning of the poem.